As promised, a post I've been meaning to put up for ages but haven't got round to previously...It gets a bit technical, but I hope you will find it interesting :-) It comes from a paper I wrote as part of my studies with Mary Bromiley and I really enjoyed doing it! Here are photos comparing a heel first and toe first landing. They were taken from video stills at the moment the foot touched the ground at walk on a concrete surface. In the heel first landing, the the latissumus dorsi, pectoral and trapezius muscles start to retract the limb momentarily before the hoof impacts on the ground. The carpus and distal limb, including the distal interphalangeal joint (coffin joint), are extended in preparation for impact. Interestingly, according to Prof Denoix, for full extension of the distal interphalangeal joint, the action of the deep digital flexor tendon is critical. The line of the DDFT is shown in red. In addition, the deep digital flexor and superficial digital flexor have an essential role in stabilising the limb and digit and absorbing energy. The limb impacts heel first to allow for this, and to enhance shock absorption. Following normal impact, as the limb begins to load during the stance phase, the bodyweight of the horse starts to move over the limb. The deep and superficial digital flexors and suspensory ligaments work in opposition to the common and lateral digital extensors to stabilise the whole distal limb as the metacarpophalangeal joint and distal phalanx are loaded. These structures are under maximum tension as the limb is fully loaded at mid-stance, storing recoil energy which is fed back as the limb unloads. When functioning correctly, this is an immensely strong system which is not only capable of absorbing enormous impact forces but of storing and releasing the energy generated by each stride. The deep digital flexor tendon, in particular, should be tightened by rotation of the metacarpophalangeal joint as it loads, and slackened by the rotation of the distal interphalangeal joint as it breaks over (per James R Rooney “The Lame Horse” 1998). 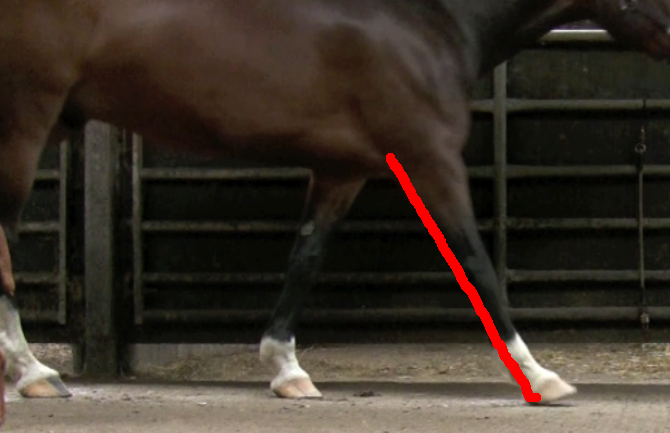 If the hoof lands toe-first, the distal interphalangeal joint is not fully extended at impact. As with a normal landing, the latissimus dorsi, pectorals and trapezius muscles are retracting the limb, stabilised by the cervical ventral serrate muscles. However the lack of extension of the distal interphalangeal joint indicates that the deep digital flexor is not tightened in preparation for impact, as it should be. 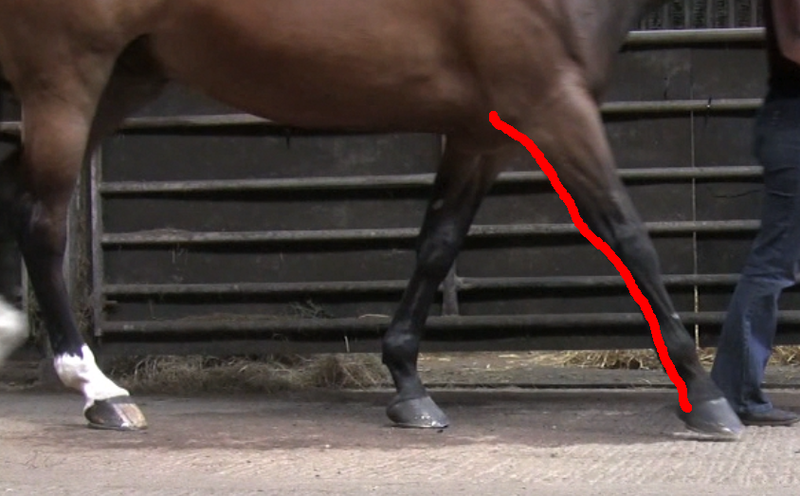 So, instead of loading being steadily increased on a smoothly tightened tendon, the deep digital flexor tendon is subjected to a sudden tightening and release as the metacarpophalangeal joint impacts with the ground while partially flexed, and further tightening as the hoof capsule loads “back-to-front” - dorsal to palmar instead of palmar to dorsal. This sudden “snap” tightening, when repeated stride after stride, leads to damage to the deep digital flexor tendon itself, as is evident on MRI of affected horses. Furthermore, the normal storage and release of recoil energy offered by the suspensory and digital flexor tendons cannot function as efficiently, since the tendon is not smoothly tightening and relaxing, and this requires the horse to use more active energy to achieve the same stride. 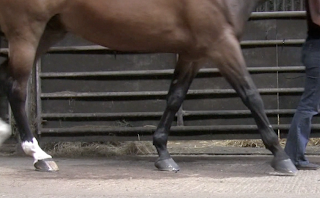 Finally, instead of effective shock-absorption being available through the structures of the caudal hoof capsule, the impact is taken by the dorsal hoof wall and distal phalanx. The distal phalanx should be an effective energy damper, but anatomically this is contingent on the efficiency of shock absorbing structures in the back and sole of the hoof (solar corium, digital cushion and venous plexus). These structures are not available to shock absorb in a toe first landing, when impact is taken by the dorsal wall. This area is not designed primarily to shock absorb, and so much of the energy of impact is likely to pass beyond the hoof and into the proximal tendons and ligaments. Clearly, in a toe first landing, the more concussive the surface and the higher the speed - the greater the stress on the deep digital flexor tendon and the more damage is likely to be done. Fascinating! Thank you for explaining! Super awesome write up - thank you! WOW. All those BIG words. Fascinating, thanks for that. One interesting contribution to the extensor system is the medial and lateral branches of the suspensory ligament. They wrap around from behind the fetlock and join the common and lateral digital extensor tendons, and they all insert on to the extensor process of the coffin bone. These suspensory branches tighten up during weightbearing, keeping the coffin bone stabilized, which allows the rear of the hoof to assume most of the responsibility for landing and weightbearing up until the point of breakover, at which point the stored energy in the suspensory apparatus propels the limb and the attached horse forward. It's a fascinating system. Horse of the week: "Dillon with the wedges"
Horse of the week? Of course its Solomon!